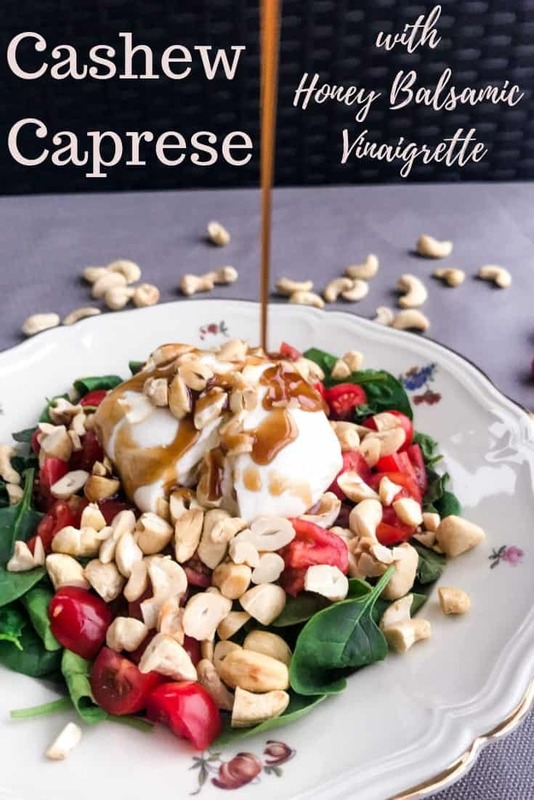 This Caprese Salad with Cashews & Honey Balsamic Vinaigrette is one of the best salads I’ve ever had, perfectly filling and with all the makings of a classic: sweet and salty, crunchy and cheesy. Oh, and with lots of healthy stuff at that! Usually I would never have a salad in November. Ever. I shy so far away from cold food in the fall & winter that my friends make fun of me. But this year – I don’t know if it’s because it’s about 10 degrees warmer than it should be and the early-November snow we usually get is yet nowhere to be seen, or if I’m just extremely vitamin deficient right now – I found myself with serious cravings. Not just for salads, mind you. For all things healthy. After all the fally pastas & risottos & surviving-the-darkness comfort foods my body put down the foot and said: No. Nope. No more. I want a salad. No, not in 6 months with a glass of rosé – NOW! 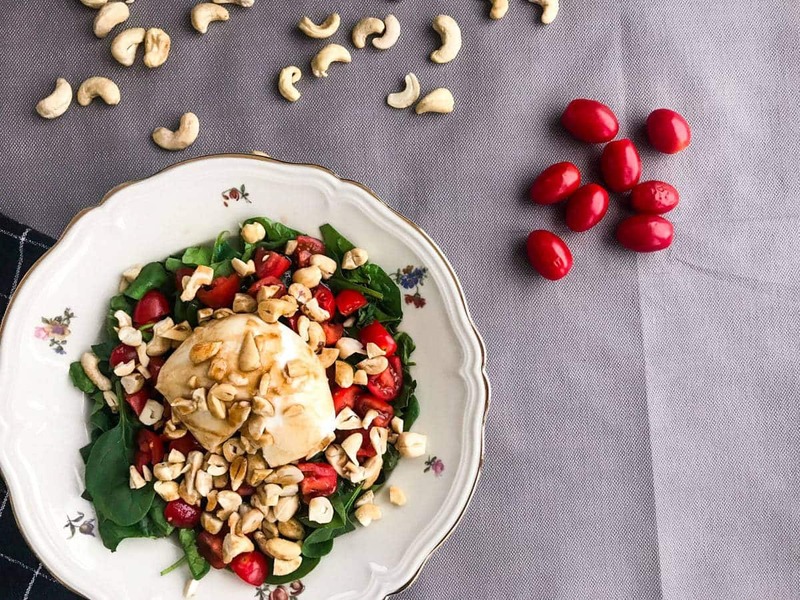 OK, so let’s talk about this Caprese Salad with Cashews & Honey Balsamic Vinaigrette then. I love a good Caprese salad, the traditional way you know with sweet tomatoes, perfectly creamy mozzarella, loads of basil and maybe topped of with loads of sea salt flakes and fresh ground black pepper and a drizzle of olive oil. The only negative of it is that it’s just not enough to satisfy me as a whole meal. On top of bread – yes please. As a side dish for grilled chicken – oh yes. And, as it turns out, in a salad with loads of spinach and a handful of lightly roasted cashews. And just as I went to top off my Caprese Salad (with Cashews!) with loads of sea salt flakes and fresh ground black pepper and a drizzle of olive oil, I stopped myself. I got to thinking about one of my favorite restaurant dishes right now, served at my Stockholm go-to place – a piece of delicious Burrata with some kind of nuts (walnuts?) and a honey-something vinaigrette. It’s so delicious and I have it every time I go there. And so I thought… this is like the salad version of that, but you’re allowed to have it for Tuesday lunch and not just for a Saturday appetizer. All it’s missing is a bit of sweetness. Enter: the delicoius & from now on until death do us apart ride or die BFF Honey Balsamic Vinaigrette. It’s a very simple vinaigrette and with no other ingredients than those right there in the name – all the better for you to be able to make it every day. Because you will want to! 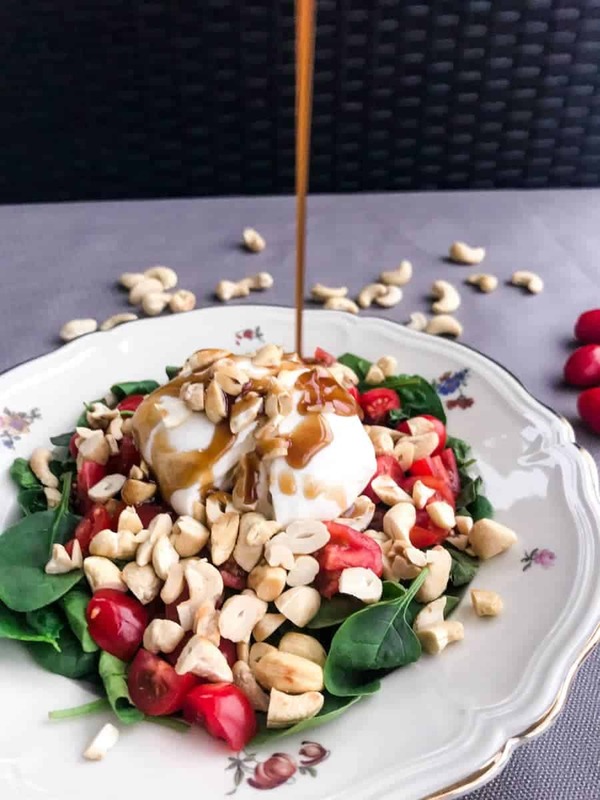 Did you try this Caprese Salad with Cashews & Honey Balsamic Vinaigrette ? 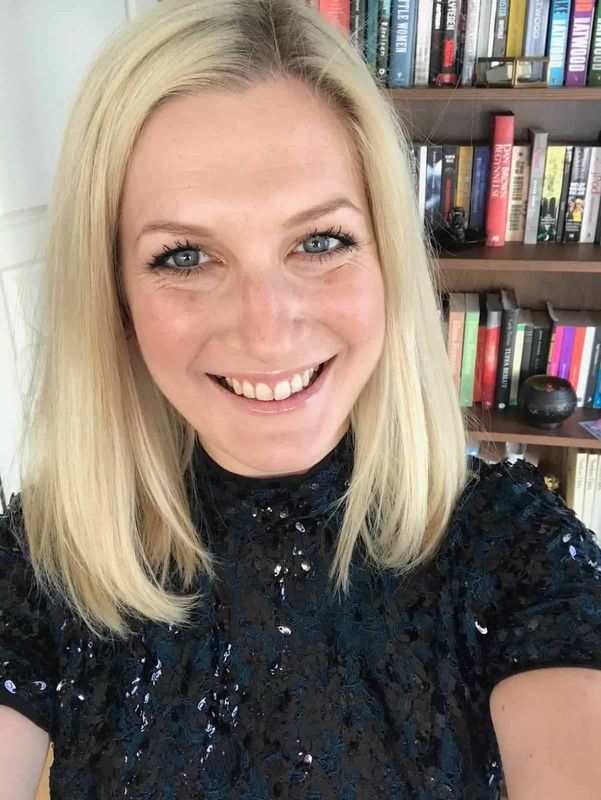 If so – please leave a comment and/or a rating below, I love hearing from you! I also love seeing your creations – so please tag me on Instagram if you post it. Start by roasting the cashew nuts over medium-high heat for a few minutes. Stir often and make sure they don't burn. They're finished when they're warm and have a bit of color. Set aside and let cool for a minute. 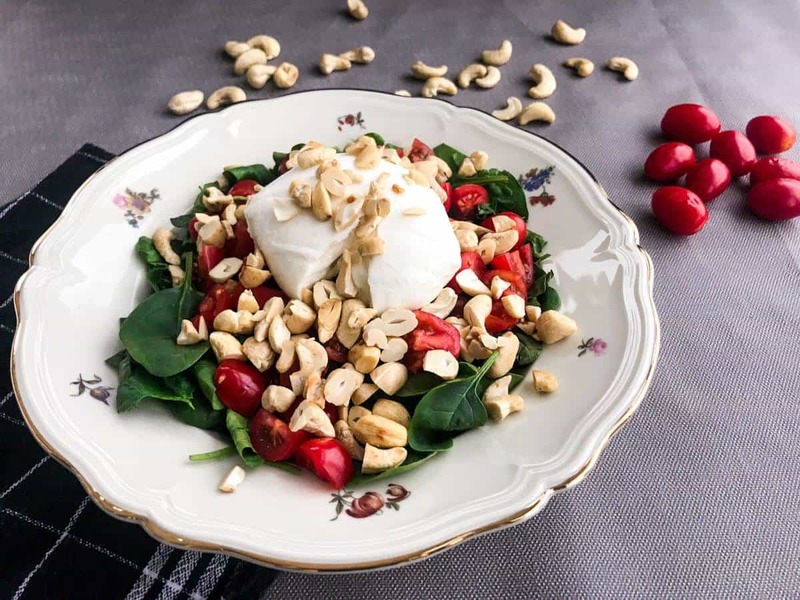 Place the baby spinach leaves on a plate and top with cherry tomatoes. Place the mozzarella cheese in the middle. Chop the roasted cashew nuts roughly and sprinkle on top of the salad. Make the Honey Balsamic Vinaigrette by mixing together all the ingredients. Taste and add more salt and honey as desired. Cashew nuts can be substituted for another type of nut - eg. walnuts or pistachios. Mozzarella cheese can be substituted for burrata cheese to make the salad even creamier & more luxurious. This looks delicious. The pictures are beautiful too. I would love to make this one day. Thank you for sharing. Oh that dressing sounds amazing. Such a lovely light salad! I have trouble stopping myself from eating it by the spoonful 😍 thanks for commenting! 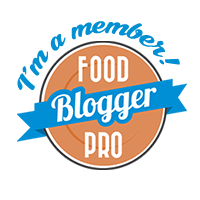 I love how the recipe is so simple to make, but the nutritional value is just awesome! The honey Balsamic Vinaigrette is a great accompaniment to this recipe! Thanks Emmeline! You’re so welcome! Thanks for commenting! Love this version of Caprese salad. 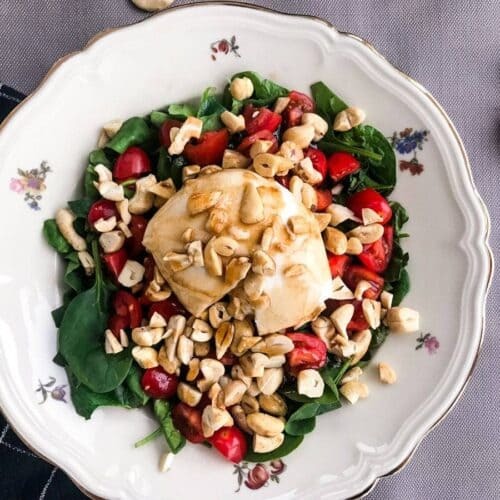 Cashews and spinach are great additions and that honey balsamic vinaigrette sounds wonderful! Makes it so much more like a meal than a side 😃 thanks for commenting! This is def something I’d like to be making for weeknight dinners. Delicious fresh flavors! Great take on a classic looks delicious, i love the sound of the vinaigrette! need to try this! Emmeline, there is not one single ingredient in this salad that couldn’t make my day! All the flavors together with the vinaigrette and the cashews, Oh my!! My kind of salad for sure!! So happy you liked it! I feel the same way – everything good in one salad 😍 thanks a lot for commenting! This recipe is perfect! It’s super easy and has so much flavor! A great, fresh salad idea! So glad you liked it! Thank you for commenting! 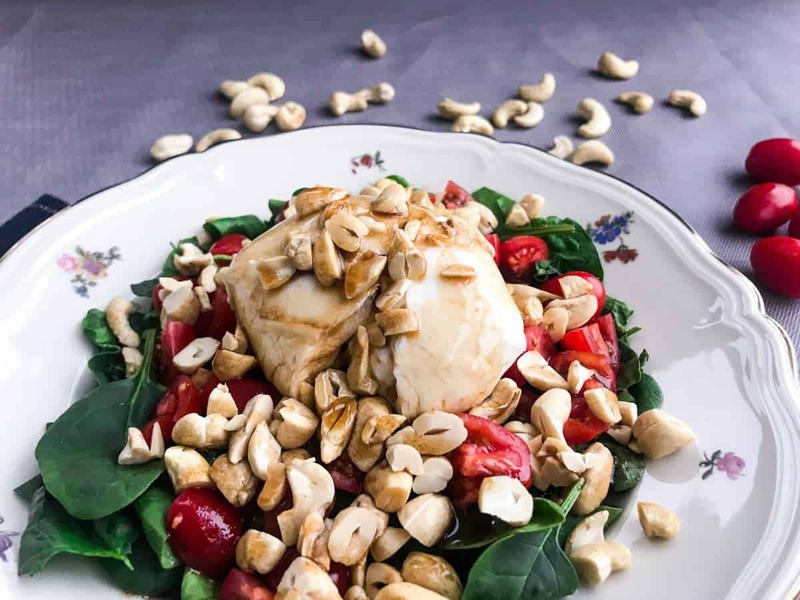 Loving the twist of this caprese Salad with the cashews. May have to try this, this week. I’m eating clementines like it’s my job. And for supper – carrots, green beans and corn. .. all the veggies. Haha right?! All the veggies & vitamins please! This looks delicious! I love Caprese salad but haven’t ever topped it with cashews or honey. I am so excited to try this! I hadn’t either and now I’m obsessed! Thanks for commenting, let me know when you try it! Yumm this looks so delicious. I love caprese salad but never make it on my own for some reason. I’ll have to try this! Thank you! I usually don’t make it a lot just because it doesn’t feel like a complete meal, so more like a side – but with this recipe I am happy and satisfied with nothing else! OMG this so creative. I have never tried something like this before. I just happen to have these ingredients so am going to make it today for lunch – – if I can wait that long! Thank you! So happy you like it 😃 oh have a nice lunch!! Let me know how it turns out! Thank you for commenting! Ooh yes a nice piece of baguette with that and maybe some extra dressing to sop up with the bread?? Yummmm never thought to add cashews to a caprese, but that’s awesome! Thank you for commenting! Gotta love a bit of crunch in a salad! What a fantastic looking salad. We eat salads year round — could be 5 feet of snow on the ground and there would be a side salad at our dinner table. It can be a bit boring having the same things. 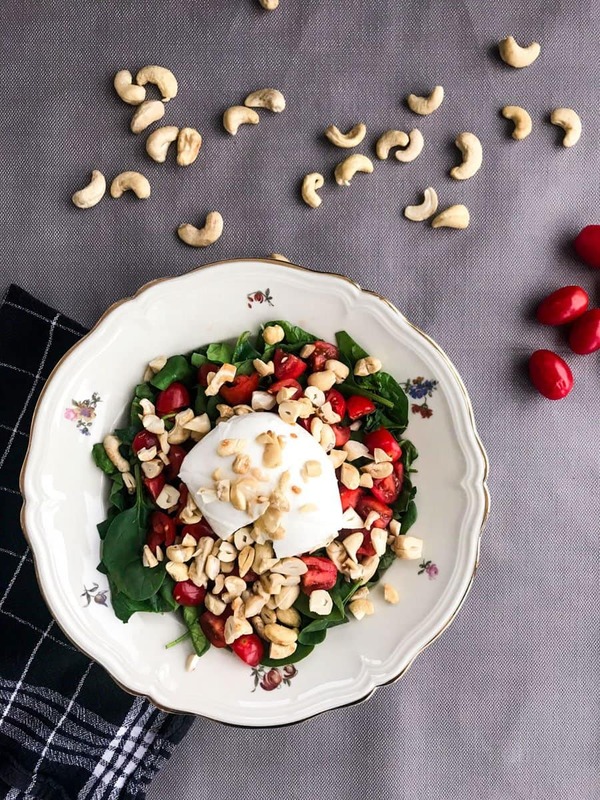 The Caprese Salad with Cashews would be a welcome switch! That is if I could keep the cashews hidden from Hubby — he loves them and would eat them for a snack. I’m pinning the recipe. I usually wouldn’t go out of my way to make a specialty salad in the winter either, but it is funny how our body craves certain things no matter the season! This photo….and all the reds in it…I can taste it! Yum! I dont think Ive ever had anything like this before but it sounds delicious and perfect for this time of year when we are all trying to be a bit healthier! that would be a delicious fresh flavors meal for me with fantastic salad. it is a nice recipe and I am happy and satisfied with this recipe. Thank you Elizabeth for commenting! Happy you liked it! I love that you add the nutrition information! That is so cool! Thank you for commenting, Ashley! Happy you like it! This looks so good and simple to make! Definitely a great go-to for a healthy and quick lunch. I’ll have to give it a try, thanks for sharing! Thank you, Nicole! Healthy, quick & very satisfying!